Amazon has released new software for the Kindle Touch that adds a number of new features and enhancements just in time for the international launch of the Kindle Touch 3G on April 27th. The Kindle Touch Software Update Version 5.1.0 is available for manual download from Amazon right now, or you can wait to automatically get the update over Wi-Fi on the Kindle in the “coming weeks”. For manual install, just download the update file, plug your Kindle Touch into your computer with the USB cable, and drag the downloaded file onto the root folder of the Kindle Touch. Then from the Kindle’s homescreen go to Menu > Settings > Menu > Update Your Kindle. New Languages: The Kindle Touch now supports multiple languages: English (US and UK), German, French, Spanish, Italian, and Brazilian Portuguese. Landscape Mode: The Kindle Touch can finally switch between portrait and landscape orientation in ebooks and PDFs. This requires going into settings and manually changing it; it doesn’t automatically rotate, and the rotation only goes two ways, not all four. Translate Words and Phrases: Tap any word or highlight a section to instantly translate into other languages, including Spanish, Japanese, Chinese, French, German, Hindi, Dutch, and Danish. The translations use Bing Translator and require an internet connection. 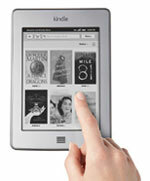 Kindle Format 8 Support: Amazon’s new format for enhanced layouts and formatting. Wi-Fi Upgrade: Support for WPS and select WPA2 Enterprise networks added. Text-to-Speech: TTS improved to add support for summaries of newspaper and magazine articles (when publishers so graciously allow it). More Sharing Options: Tell others what you’re reading on Facebook or Twitter from anywhere within a book — just tap to share a link along with your comments. Keyboard Suggestions: the keyboard now displays suggested words as you type to help make typing faster and easier. A few other things I’ve noticed since the update is individual words can be referenced on Wikipedia (the other Kindles already had this so it’s about time), and there’s now an option after selecting text to “report content error”, which opens a window to type and send a message (I wonder who gets stuck reading that stuff). One of the bad things with the update is that it makes some active content (games) not display properly. I’ve noticed this with a few different ones where text renders much larger than it should. Amazon even acknowledges this in the troubleshooting section on the update page, saying the “Active Content title needs to update itself after the Kindle Touch software update completes”. Uh…yeah. Provided the active content has been updated too. It’s hard to say with ghosting. I thought is was the same initially but after doing a bunch of testing for ghosting, it doesn’t seem to be doing it as much anymore. Usually before I could see the keyboard after it went away but I’m not seeing it now. The web browser still has lots of ghosting though.